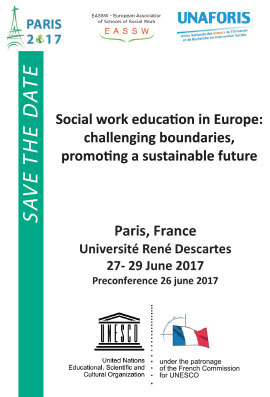 The European Association of Schools of Social Work (EASSW) is a European association of institutions of social work education, organizations supporting social work education and social work educators. Its mission is to promote social development and develop high quality education, training and knowledge for social work practice, social services, and social welfare policies in Europe. In fulfilling its mission the EASSW adheres to all United Nations' Declarations and Conventions on human rights, recognizing that respect for the inalienable rights of the individual is the foundation of freedom, justice and peace. Members of EASSW are united in their obligation to the continued pursuit of social justice and social development. In carrying out its mission EASSW fosters cooperation, collegiality, and interdependence among its members and with others.